If you didn't already know that Sia loved wearing wigs, well, now you do: Sia graced the cover of 'Interview' Magazine's April Issue wearing one of her biggest and most interesting wig choices to date. Of course, this isn't the first time the singer/songwriter has showcased her big hair look before. 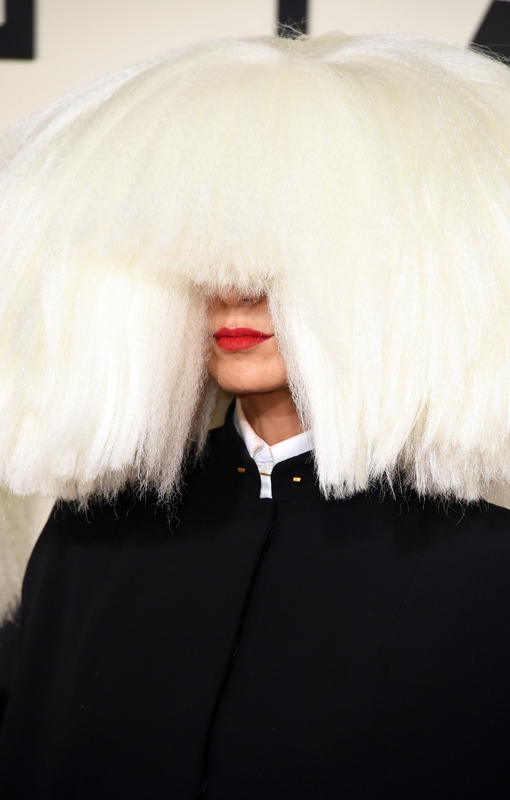 Sia, along with "Chandelier" dancer Maddie Ziegler, also wore a similar type of wig at the Grammys earlier this year. The camera shy star has been known to keep her privacy, but when it comes to her music, she obviously doesn't mind showing her true colors. While Sia almost never shows her face during performances or public appearances, her image completely parallels her music and makes her a true artist. If that wasn't reason enough to pick up this issue of Interview, here's another: Kristen Wiig is the one who conducts it. During the interview, Sia tells Wiig, "I’m trying to have some control over my image. And I’m allowed to maintain some modicum of privacy." Cheers to you, Sia. On the cover, Sia rocks dark lipstick, said platinum curly wig, and a sheer-caged black/navy top. The wig is so enormous, you can hardly notice any of Sia's facial features, which is probably how she intended it to be. The wig as a focus can be seen throughout the rest of the editorial: the Grammy-nominated artist dresses up in multiple types of wigs, sporting a grungy punk look in one photo and a futuristic mod look in another. Basically, she looks fabulous, face or no face. On top of soaring in the music world and having a particular eclectic taste in fashion, Sia will also be working on a new project. She explains, "I’m on page 65 now of the screenplay. I wrote a short story eight years ago. It’s called Sister, and I’m going to direct it. I just want to make a beautiful film. I’ve had it in my head for so long, so I want to try. Every now and again, I get scared..."
Whatever project Sia does, I can't wait to see what daring move she makes next, whether or not a wig is involved.